This may be one of the most exciting Olympiads in history for a couple of different reasons. First, the playing field is leveling and for the first time in many years, a team from a developing nation is expected to medal. There are also the presence of a number of young teenage stars playing for their countries. Second, there will be the FIDE General Elections to choose a President to lead the organization. The campaign has been fiercely contested and on June 2nd, federation will cast their ballots. India, with Viswanathan Anand at top board, a rejuvenated Krishnan Sasikiran and a much-improved Pentala Harikrishna on board #3, will certainly vie for a medal. The U.S. will carry a high-powered team to Turin and the young stars Hikaru Nakamura and Varuzhan Akobian will make their Olympiad debut. Gata Kamsky is currently showing good form at the M-Tel. The U.S. has an excellent shot at taking a medal. The usual dynamos will be present in Russia who will boast another 2700 team with Vladimir Kramnik on the roster; Armenia with a super-charged Levon Aronian; the Ukraine has a vastly improved Sergey Karjakin. Olympiad tournaments always bring magical stories to the fore. Players from obscure countries are discovered after a medal performance and can set the pace for advancing chess in that country. There are also very interesting stories. One that will get some attention is former Women's World Champion Zhu Chen of China playing for Qatar… on the men's team! She is married to the country's top player Mohammad Al-Modiakhi. The are a number of federations making their debut, but the allure of the biennial Olympiad is exciting for even the most seasoned chess nations. Over 140 nations will trek to Turin, Italy to usher in a new era of chess. Teams for developing federations will attempt to best their previous marks and players will be jockeying for coveted medals. 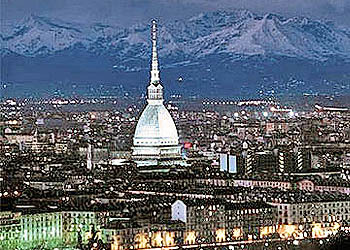 The playing venue in Turin is projected to provide a classic view of the teams in the throes of battle. It should be an exciting two weeks! "Drum Predictions for 37th Olympiad!" "2006 Olympiad: Shift in Balance of Power"
Wiener Zeitung (Olympiad Database) Excellent Stats! Official Site of 37th Chess Olympiad Live Games!